Directions to all of our meet locations and offices. Use the navigation above to select the location you need directions to. 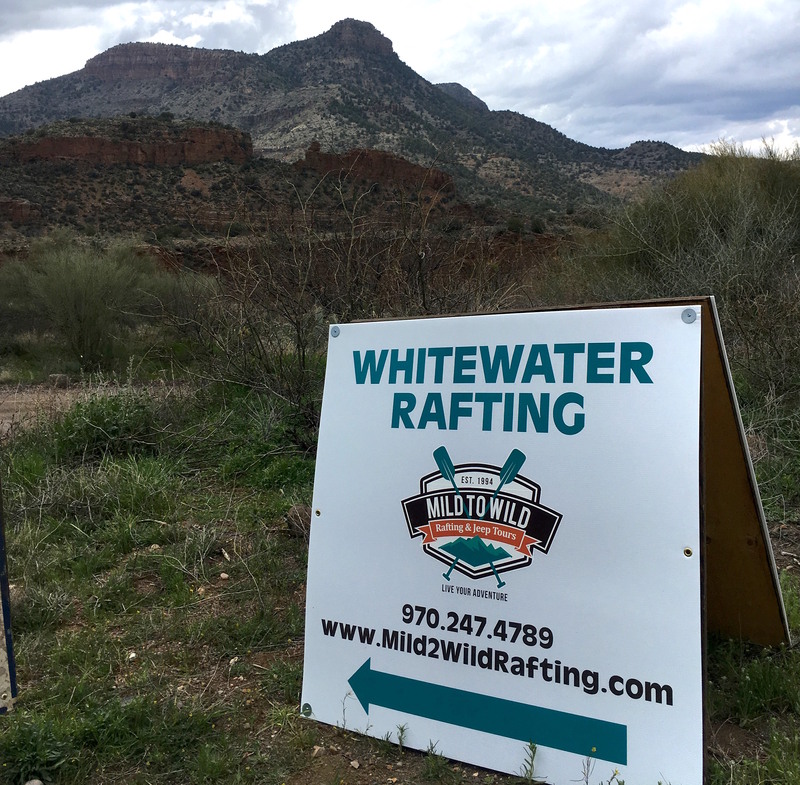 Our main office is the meeting point for: Lower Animas River, Upper Animas River, La Plata Canyon Jeep Trail Tours, Full Day Jeep Trail Tours and Mesa Verde Tours. Our office is located at 50 Animas View Drive, which is located at the north end of Main Street in Durango. If you are coming from the downtown area or the south end of town you want to head north on Main Street. You will pass City Market and 32nd Street, go another 6 blocks and Animas View Drive will be on the right side of the road. We are diagonally across from the Hampton Inn. You will be able to see our building and buses from Main Street. If you are coming from the north, head south on highway 550 towards Durango. When you get to Durango you will pass the Iron Horse Inn on the left, continue about another 1/2 mile and you will see Animas View Drive on the left. We are the first building on the right with all of the big white buses. You may meet at our Moab Office (745 Kane Creek Road) the night prior to your trip departure at 7:00 PM. You will be able to meet with your guide and receive your dry bag to pack your belongings that evening. This is also a great time for you to ask any last minute questions! Please make sure that trip minimums for your trip departure have been met before making travel arrangements! Directions from Grand Junction, CO: Take I-70 West to US 191 or take route 128 which follows the Colorado River. This is a 2 hour drive, 113 miles. Directions from Salt Lake City, UT: Take I-15 South to the Price/US 6 exit. Then take US 6 to I-70 East, to US 191 South. This is a 5 hour drive, 234 miles. Directions from Denver, CO: Take I-70 West to Thompson. Then take exit 182 from I-70 W. Follow US-191 S to Moab. This is a 5.5 hour drive, 354 miles. Directions from Durango, CO: Take US-160 W to CO-184 W. Follow CO-184 W to US-491 N then follow US-491 N and US-191 to Moab. This is a 2.75 hour drive, 158 miles. Rental Cars: There are two Enterprise Rent-A-Car locations in Moab, UT. Please contact them directly to arrange your rental car at (435) 259-8505. Columbine Park – 1227 Blair Street, Silverton, CO From the train’s boarding location on Blair Street, walk a ½ block North and West to find the park, bathrooms and our tour vehicles. We are just adjacent to the Eureka Bar. Leave town on U.S. 160 East for approximately 40 miles, you will cross the Piedra River and turn left on Forest Rd. #622 (First Fork Road). Drive down this dirt road for one mile. Pull out on the left. Leave town on U.S. 160 West for approximately 20 miles, just as you reach the Piedra River (do no cross the river) turn right on Forest Rd. #622 (First Fork Road). Drive down this dirt road for one mile. Pull out on the left. Meet at Caddis Flats Campground off of Jct. CO 145. At the only stoplight in Mancos, take a right onto CO-184. Continue West on CO-184 for 20-30 minutes until you reach a T in the road. At the T, take right onto CO-145 N. Continue through Dolores, Rico and over Lizard Head Pass (about an hour) until you reach a round-a-bout in the road. Turn left, staying on CO-145 N, passing through Sawpit and Placerville. After Placerville, you will come to a final T. Turn left (staying on CO-145) and continue 1.8 miles. Caddis Flats will be on the left, shortly after mile marker 86. It is a BLM campground and the sign is only visible after you pull into the parking lot. Head out of town on CO-145 W and continue through Sawpit and Placerville (about 20 minutes). After Placerville, you will come to a T in the road. Turn left (staying on CO-145) and continue 1.8 miles. Caddis Flats will be on the left, shortly after mile marker 86. It is a BLM campground & the sign is only visible after you pull into the parking lot. Directions from Cortez, CO: travel north on US-491. After Pleasant View, turn right onto County Road Ee, turn left onto County Road 16, and then right onto County Road S. Turn left onto Bradfield Recreation Road to reach Bradfield Recreation Site. The river and boat launch will be on the right. For the Trails & Rails package, meet at the Durango Train Station parking lot, located at 209 West College Drive next to McDonald’s and across from Wells Fargo. The cost for daily parking is $8 per regular sized vehicle. The day of your trip you will need to meet at our meet point in the Salt River Canyon. When coming from the South, look for the bathrooms on your right (pictured below). You will cross the bridge and see our Mild to Wild raft sign on your left right after the bridge. Drive time is about 2.5 to 3 hours. 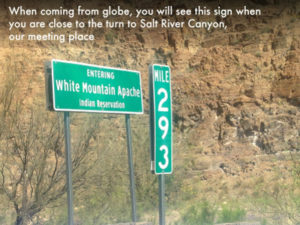 Take Highway 60 east (Superstition Highway) to Globe. Pass through Globe to the intersection of Highway 60 and 70. There is a traffic light here with a Taco Bell and Rebel Mart gas station on the right. Highway 60 turns left, heading north towards Show Low. Turn left and follow the Highway60/77 north for 41 miles to the Salt River Canyon Bridge. Cross over the bridge and turn left onto the dirt river access road. Follow the Mild to Wild signs to our check-in site and we will direct you where to park! Drive time is about 3 hours and 15 minutes. Take Highway 77 north (Oracle Road) to Globe. Turn left at the intersection of Highways 77 and 70, heading to Globe. At the first traffic light turn right onto Highway 60/77 north to Show Low. There is a Taco Bell and Rebel Mart gas station on the left. Follow Highway 60/77 north for 41 miles to the Salt River Canyon Bridge. Cross over the bridge and turn left onto the dirt river access road. Follow the Mild to Wild signs to our check-in site and we will direct you where to park!When coming from the North, look for a dilapidated gas station on your left (pictured below). You will see our Mild to Wild raft sign shortly after on your right. Drive time is about 3.5 to 4 hours. Start out going northeast on North State Route 89A/AZ-89. After about 24 miles, turn right onto West John Wesley Powell Boulevard, then, merge onto I-17 North/AZ 89 ALT North via the ramp on the left. Keep right to take Exit 340A towards I-40 East. Continue for 89 miles, then, take Exit 285 (I-40/US-180) towards AZ-77/Show Low. Continue on AZ-77 through Show Low (turn right on AZ 60/77 to continue through town). Continue for about an hour to the Salt River Canyon Bridge, DO NOT cross the bridge! The meet location is on the right down a dirt road just before the bridge. Follow the Mild to Wild signs to our check-in site and we will direct you where to park! Drive time is about 4.5 to 5 hours. Take AZ064/US-180 South for about 55 miles. Merge left onto 1-40 East and continue for about 120 miles to Exit 285 for I-40/US-180 East (toward AZ-77/Show Low). Continue on AZ-77 through Show Low (turn right on AZ 60/77 to continue through town). Continue for about an hour to the Salt River Canyon Bridge, DO NOT cross the bridge! Drive time is about 3 hours and 15 minutes. Start out on I-40 East toward Albuquerque for about 86 miles. Take Exit 285 for I-40/US-180 East (toward AZ-77/Show Low). Drive time from Durango is 31 minutes. The motel will be on your left hand side. Drive time from Cortez is about 21 minutes.